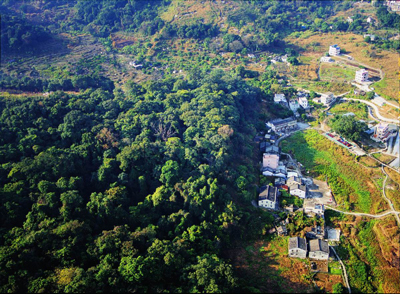 Southern China villages are typically set in exuberant woodlands. A formula that promotes harmony of man and nature, it creates a sylvan setting in which vegetation and village houses blend in perfect fusion. The fung shui woods that exist alongside rural communities fully illustrate the consonance between man and the natural environment. Believing that forests will bring good fortune, early villagers chose to settle in wooded areas. Another reason for building villages near fung shui woods was that they commanded great significance both religiously and pragmatically, and therefore called for preservation. In this backdrop, fung shui woods flourished in rural Hong Kong. In the past, the New Territories were dotted with villages. Many of them were built beside fung shui woods. As urbanization slowly ate its way into the hinterland, the rural population dwindled, and some villages were abandoned altogether. Today, despite the end of an era, the important fung shui woods that witnessed the ups and downs of rural lineages continue to thrive. They create valuable habitats to support diverse wildlife. Once cultural icons of traditional Chinese villages, fung shui woods are now ecological treasure-houses. Most fung shui woods strike a sharp contrast with the sparse grass and shrubs on nearby slopes. For this reason many think they provide the clues for understanding the characteristics of Hong Kong’s native vegetation. In other words, surveying and studying the ecological features, structure and species composition of fung shui woods can help us understand the attributes of other forests in Hong Kong, and make informed comparisons. 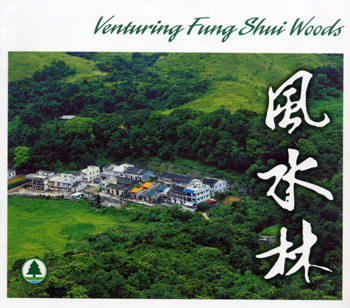 In 2002, the Agriculture, Fisheries and Conservation Department began a territory-wide survey on fung shui woods. To create and maintain a complete database for woodland conservation, 116 fung shui woods were surveyed and their latest status recorded. In the past decades, fung shui woods were preserved because villagers believed in geomancy. Today they are conserved for different reasons. Knowledge will light the way as we learn to cherish and delight in these precious forests. Adopting an attitude of harmonious co-existence, we should do our best to protect fung shui woods, so that they are cherished by future generations. For a more detailed and comprehensive treatment of fung shui woods, the book Venturing Fung Shui Woods is recommended for further reading. Joseph K. L. Yip, Y. N. Ngar, Jackie Y. Yip, Eric K. Y. Liu & Patrick C. C. Lai. 2004. Venturing Fung Shui Woods. Friends of the Country Parks, Agriculture, Fisheries and Conservation Department & Cosmos Books Ltd., Hong Kong.